Gaylene, an Environmental Services staff member at CKH for the last seven years, has worked with the Poor Handmaids of Jesus Christ in various capacities for 28 years. She began her career here at the Poultry Farm as an egg gatherer and packer. When the Poultry Farm closed, she moved onto Dietary Services at the Motherhouse for the next 11 years. Later, she made the move to Environmental Services and has enjoyed the variety of job experiences. Her primary unit at CKH is the Memory Unit, and she relates, since she cares for her Mom, who also suffers from dementia. “I can learn about it and see what to anticipate next. They ( the memory unit residents) come out and visit with me while I clean. I think of them as my grandmothers,” Gaylene said. She considers the Poor Handmaids of Jesus Christ Sisters her family as well. In 1991, Gaylene lost her husband and the father of her three young children in a tragic car crash. The Sisters responded in the kindness and care of co-workers they’re known for. “I am still so grateful” Gaylene said. Gaylene has moved onto happier times. 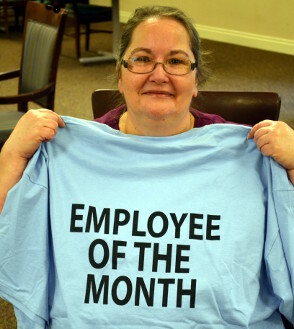 She’s remarried and enjoying life as a grandmother, and now as the Employee of the Month. Congratulations Gaylene! 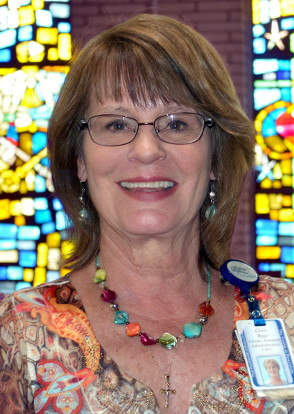 Catherine Kasper Home Executive Director Carol McGuigan named nurse Megan Hatfield, R.N. Employee of the Month for May during a staff meeting on June 10, 2016. Megan had no idea it was going to be her, so she was thoroughly surprised by the honor. “I figured it would probably be someone else,” she joked. 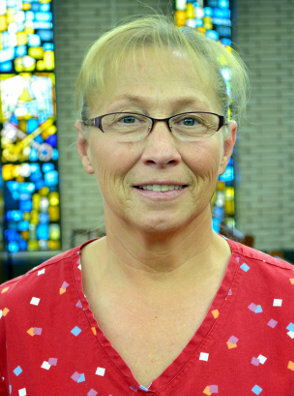 Since January, Carol has named a staff member who embodies the core values of the Poor Handmaids of Jesus Christ Sisters, and who also has no absences, tardies or write-ups for the month, the Employee of the Month based on staff nominations. Overall, Megan has loved the idea. “It’s nice to have that. It makes the staff feel validated,” she said. Megan is a legacy among The Center at Donaldson co-workers. Her Mom, Ruth Hatfield, worked in the Communications Office while Megan was a child, so she grew up around the Poor Handmaids of Jesus Christ Sisters. 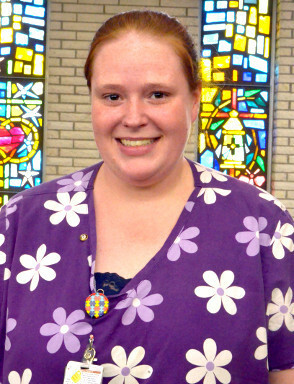 Megan began working at CKH while she attended Ancilla College. 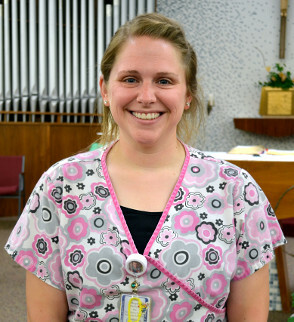 After graduating with her Associates degree in Nursing from Ancilla in 2012, Megan got her B.S.N. from the University of Cincinnati. Her six year-old son, Cameron, is proud of his Mom, and so are we. Congratulations Megan! Certified Nursing Assistant Kayla Tauretis of Grovertown never looked back after coming to work at Catherine Kasper Home from a larger, chain facility three years ago. “Here’s better,” she said. Not only does she like being closer to home, she also loves the welcoming environment here. “The staff is very helpful, and the residents are absolutely awesome, just awesome,” she added. No doubt, they feel the same way about Kayla. Kayla works on the rehabilitation hall, and she said her favorite parts of the job is seeing the residents get better and go home as they progress in their therapy. “I have a part in helping them get better,” she said. “They make you feel like you made a big difference in their lives,” Kayla noted. According to CKH Executive Director Carol McGuigan, an act of kindness to a resident by Kayla made the April pick an easy one. While it may have been all in a day for Kayla, it meant the world to the resident. He wanted to get a birthday present for Father John Zmelko, but was having trouble meshing schedules with his family members to arrange a ride. “He’d been wanting to shop all week, and no one could do it.” By being open and receptive to the Spirit, Kayla asked; “What would it take for me to do it?” She asked one of the receptionists to call transportation services to arrange a car. With keys in hand, Kayla clocked out and took the gentleman to Wal-Mart to shop for Father John’s birthday present. Then they went out for sandwiches at Arby’s in Plymouth. The resident was happy he would be able to give Father John a birthday gift, and Kayla was happy to serve joyfully. Congratulations Kayla! Catherine Kasper Home Social Services Coordinator Crystal Bower had a sneaking suspicion she was going to be named the March Employee of the Month Tuesday when her supervisor, Executive Director Carol McGuigan, asked her to attend an additional session of HIPPA training, the one in which she was making the announcement. She was correct. Following the session’s opening prayer, Carol bestowed the honor on Crystal from what she said was the stiffest round of competition for the award to date. Carol called Crystal an all-around great staffer, citing her ability to do anything. What really set her apart from the other nominees, Carol noted, is that Crystal prays with and for her clients and co-workers. For her part, Crystal gives all the credit to the Lord, and to her fellow staff members whom she called equally deserving the honor. “Everybody deserves to be recognized,” a humble Crystal said. 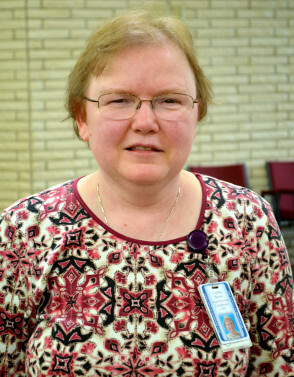 She joined CKH in January 2014 after a career in guardianship at Real Services in South Bend. On Easter Sunday, she organized an hymn singing activity for CKH residents. “Luckily, I found a resident who played the piano, so we didn’t have to do it a cappella,” Crystal laughed. Congratulations Crystal. Catherine Kasper Home Executive Director Carol McGuigan has named Donna Hite, a CKH Environmental Services staff member, Employee of the Month for February 2016. Carol, who culls from nomination by fellow staffers, residents or family members, chooses the monthly winner. 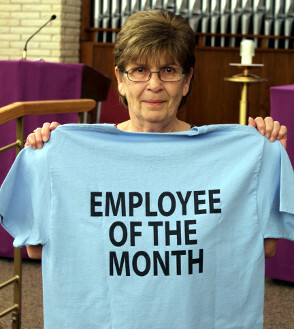 The monthly honoree must also have perfect attendance for the month they’re named, have no write ups, and embody the core values of the Poor Handmaids of Jesus Christ, according to Carol. The winner is then ineligible for the next twelve months, giving other co-worker a chance to be recognized. Donna has worked with the Poor Handmaids for 29 years. 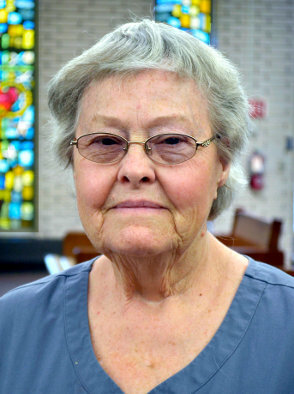 She began part time in Environmental Services at the Motherhouse. After leaving briefly to work at a local bank, the Culver native returned at the urging of one of the Sisters. When asked about her reaction to winning the honor, Donna said she was stunned. “My friend said the look on my face was priceless,” she said. “It’s a humbling thing, too, to be thought of that way,” she added. Donna’s favorite part of the job is the residents. “I make a home for them. Without them, I wouldn’t be here. It’s good to be needed.” She tells residents that if ever something’s not to their liking, she wants to know so she can make it right. “We take a lot of pride in what we do; we strive for a clean place,” Donna added. Dietary Aide Michelle Rock is the inaugural Catherine Kasper Home Employee of the Month, an award started by new Executive Director Carol McGuigan. 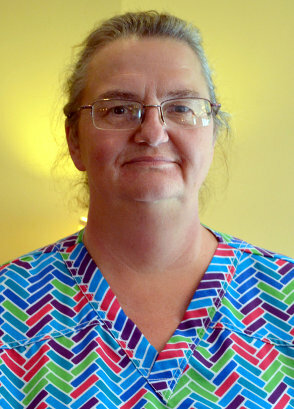 Michelle, who lives in Knox, has worked at Catherine Kasper Home for seven years. “I feel so grateful,” Michelle said of the honor. 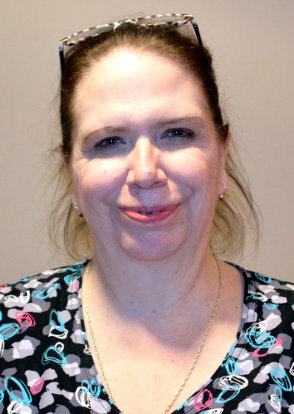 The best part about working at CKH is the Sisters, the residents and her fellow co-workers, according to Michelle. 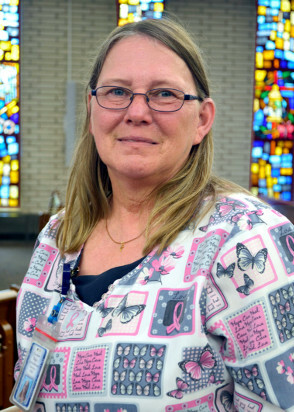 A former factory worker for 19 years, she was laid off from that job around the same time her daughter was getting her degree from Ancilla College. Then she saw an ad for a Dietary Aide at Catherine Kasper Home. She knows she made the right call in applying for the CKH job instead. “I’ve always known I was supposed to be here. I just felt comfortable here from the very first day,” Michelle said. Michelle says the Sisters and residents make her feel appreciated everyday on the job. Her work motto, besides “be kind and be yourself” is the Golden Rule of always treating others they way she’d want to be treated. “The simplest things make people happy. Getting someone the kinds of foods they like is like gold. It makes my day to see them happy,” Michelle said. Catherine Kasper Home is a ministry sponsored by the Poor Handmaids of Jesus Christ and located at The Center at Donaldson.